The My Bikeroute wiki, launched in October 2010, is a first step in a NSW Government program to improve the availability of information about bike-riding in the State. In the first 10-week phase they we are asking cyclists to help map the "bikeable" street network in Greater Sydney – not the bike lanes, shared paths or marked bike routes that make up the existing cycleway network, but those links in the local street and path system that are good places to ride, being quieter, more direct, less hilly or simpler to navigate than a busy road. They are also collecting information on bicycle hazards. There is an opportunity to identify parts of the street or footpath network which could form a bike-friendly direct link with signage or line-marking changes. Over the 10-week My Bikeroute project timetable, the plan is to record this information electronically as a series of lines and points. 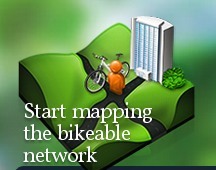 A complete bike route can also be uploaded directly form bike computers. Any feedback received during this first phase will help the development of longer-term online solutions for the NSW Government to get feedback from cyclists. This page was last modified 10:42, 15 October 2010.